Often I eat a yummy dish at a restaurant and then I rush home because I am so excited to try to recreate it. Well, recreate it with way less salt. 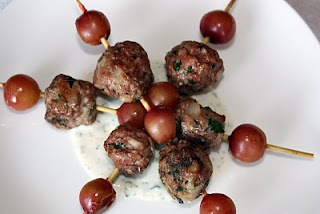 One dish that I did that with, and I am excited to share with you, is skewered lamb meatballs with grapes and a yogurt /dill dipping sauce (similar to Greek Tzatziki). I think that the savory lamb, with the roasted grapes and cool dip work really well together. You have already read that I love lamb and anything with yogurt. I especially love the use of roasted grapes in this recipe. They are savory and sweet and loaded with nutrients. Many of grape’s health benefits come from a category of phytonutrients. These compounds appear to decrease the risk of heart disease, by lowering LDL cholesterol and strengthening the heart muscle. They are also beneficial for those with hypertension. Grapes prevent lung cancer, are anti-microbial and lower the risk of Alzheimer’s Disease. Grapes are a great source of manganese, vitamin B6, thiamin, potassium and vitamin C.
Soak skewers in cold water so that they will not burn. Mix the first five ingredients together to make the dip and put aside to let the flavors meld. Work the remaining ingredients together (minus the grapes) thoroughly with your hands. Cover with plastic wrap and leave in the refrigerator for 30 min. Preheat the oven to 375F. Once the 30 minutes is up, remove the meatball mixture form the refrigerator and roll into little meatballs. 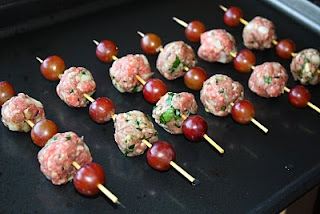 Remove the skewers from the water and skewer a meatball and then grape, alternating. Once they are skewered, place on a rack in the oven and bake for 7-10 minutes (this depends on the size of the meatball). Then rotate with tongs, and bake for another 7-10 minutes. Remove from the oven. Sprinkle with sea salt and pepper. Serve skewers with dipping sauce, either plated (as shown) or with the dip in a bowl on the side. This recipe includes so many things that I love. I need to go buy some skewers so I can make these. yum! i love Mediterranean food! Oh goodness, I just got so hungry. Why do all my meat photos look weird, and yours look mouth-watering?!?!?! I've never tried lamb meatballs before! Sounds fantastic!! Whenever I try a really good dish at a restaurant, I do the same thing. Sometimes it just doesn't turn out as good as I hope, but still I get inspirations and ideas, too. This looks really great. Thanks for sharing the idea and recipe! Nice combination. I've never tried it with grapes. Hard to find some really good lamb here though. Might try it with beef instead. I love your pairing of lamb meatballs with roasted grapes, how delicious! Glad to see you back online! Lamb is a favorite! These meatballs look savory-delicious but I also love the idea of getting a pop of sweetness from the grapes. Love lamb and yogurt, of course, but most of all loved the original presentation! Just another reason to love grapes! Enjoyable post!!! Lamb and grapes is new to me. Thanks for sharing. Lamb and grapes sounds good together. I imagine that the tart grape tastes sweet when eaten with the savory lamb. This whole mixture would taste good in a pita. Roasted grapes! YUM! That sounds phenomenal with the lamb. This looks perfect! I love lamb. These look moist and satisfying. woah roasted grapes, that's something new! Looks so good! They look so so so good!!!!! 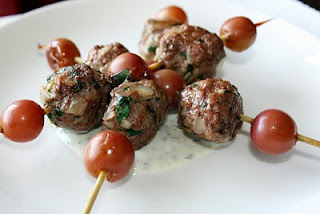 My children love lamb meatballs But I haven't tried with grapes. I wonder how it taste. I tried these and they were OMG good! Roasted grapes are my new fav thing!